Bibler Home and Gardens is privately owned and you must contact us in advance to visit. We are open during May, July and August only (no June or September showings), and are closed on weekends (except for specific events in May). Please read the following carefully. 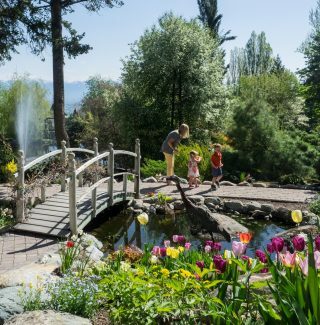 Visit the the home and gardens while thousands of tulips and daffodils bloom on Saturday May 11, Saturday May 18, or Sunday May 19. Choose from an 11 AM or 1:30 PM tour time. These guided tours of the home and gardens are 2 hours, including plenty of time to tour the Gardens on your own. Tickets are $15 for adults, $5 for children. Please note: The 1:30 tour on Saturday, May 18 offers the option of a $20 ticket that includes the extensive Persian tribal rug and weaving collection. (If you choose this option we recommend not bringing children). OR, treat someone special to a wonderful Mother’s Day champagne brunch on Sunday, May 12, beginning at 11 AM. FVCC’s Culinary Arts chefs will prepare a fabulous feast that you can enjoy in the beautiful Bibler home, with ample opportunity to stroll the Gardens on your own. It’s a delightful day complete with music and smiles all around. Tickets are $60 per person or $110 per couple. Tickets for all Spring Weekends events must be purchased in advance–no ticket sales at the door. For tickets, call (406) 756-3632, or purchase tickets online. All proceeds benefit student scholarships at Flathead Valley Community College. Enjoy the gardens in the magical evening light. The week begins with a Garden Party on Monday, July 22 beginning at 5:30 PM. FVCC’s Culinary Arts program will serve a fabulous summer buffet along with wine and other beverages. Delightful violin and piano music will fill the air as you explore the home and gardens at your leisure. Tickets $60 each or $110 per couple. 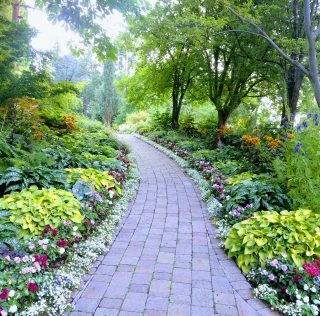 On Tuesday July 23 through Friday, July 26, come tour the home and gardens with thousands of annuals and perennials at their peak. Choose from a 4:30 or 7 PM tour time. Guided tours of the home and gardens are 2 hours and include plenty of time to explore the gardens on your own. Tickets are $15 for adults, $5 for children. Tickets must be purchased in advance–no ticket sales at the door. For tickets, call (406) 756-3632, or purchase tickets online. Spend part of a sweet summer day at the home and gardens. Choose an 11 AM or 1:30 PM tour time. Guided tours of the home and gardens are 2 hours and include plenty of time to explore the gardens on your own. Tickets are $15 for adults, $5 for children. We highly recommend attending one of the scheduled events above, but if you’re unable to do so, you may arrange a private showing for up to 30 people. We charge $15 per person, with a $150 minimum charge. We provide these opportunities during daytime hours on weekdays only. Examples of private showings include home and garden tours, picnics, educational tours, plein air painting and photography classes. We can also accommodate small group photo shoots (e.g., portrait sessions) for a smaller fee. To arrange private showings, please call 406-755-6578 or e-mail Tyler . Please note that we do not host weddings or similar events. We do provide limited opportunities for selected non-profits to host fundraisers or donor thank you events. We’re located 10 minutes west of downtown Kalispell. Our address and driving directions will be provided when you arrange your visit.